Set 1,968 feet (600m) above sea level, Krasnaya Polyana, ('red meadow') is fast becoming the most popular ski resort in Russia. 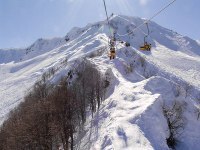 Skiers and snowboarders in Krasnaya Polyana can enjoy magnificent panoramic views of the West Caucasus. Located just 25 miles (40km) from Sochi and the Black Sea coast, Krasnaya Polyana is sometimes called the 'Russian Courchevel" for its well-groomed pistes, good après-ski nightlife, and high prices. The resort owes much of its popularity to its excellent heliskiing opportunities, but there are also good runs for beginners. The resort underwent massive renovations ahead of the 2014 Winter Olympics in Sochi. Olympic facilities located in Krasnaya Polyana include the Russian National Sliding Centre (luge, bobsleigh, and skeleton), Psekhako Ridge (biathlon, cross-country skiing, and Nordic combined), Roza Khutor Alpine Resort (Alpine skiing and snowboarding), Alpika Service Mountain Resort (freestyle skiing), and Russian National Ski-jumping Centre (ski jumping and Nordic Combined).